The focus of a meeting to stop Bill 66 changed – given the withdrawal of the land-use-oriented Schedule 10 – into an examination of the motivation for the Ford government’s attempts to facilitate urbanization in Ontario. 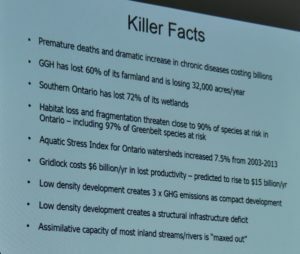 “Bay Street and the big banks and the pension funds are driving a lot of this,” former provincial planner Victor Doyle told around 100 people gathered at the Guelph Arboretum on February 2 2019. Major investors have a great interest in the conversion of farmland to urban purposes because the value of that land goes up overnight, Doyle said. Doyle is known for winning a grievance against the Ontario government after having been demoted in 2017 by the Wynne Liberals for publicly challenging building industry claims that the Greenbelt and the Growth Plan were driving up house prices and cutting off the supply of desirable low-density housing in the suburbs. Ontario Green Party leader Mike Schreiner noted that only 20 per cent of land slated for development in the ‘White Belt’ surrounding the GTA has actually been developed. But there are many speculators who have purchased rural land in the hope of achieving the instantaneous equity that comes if a local municipal council agrees to convert it to urban use and the change is approved by the minister. 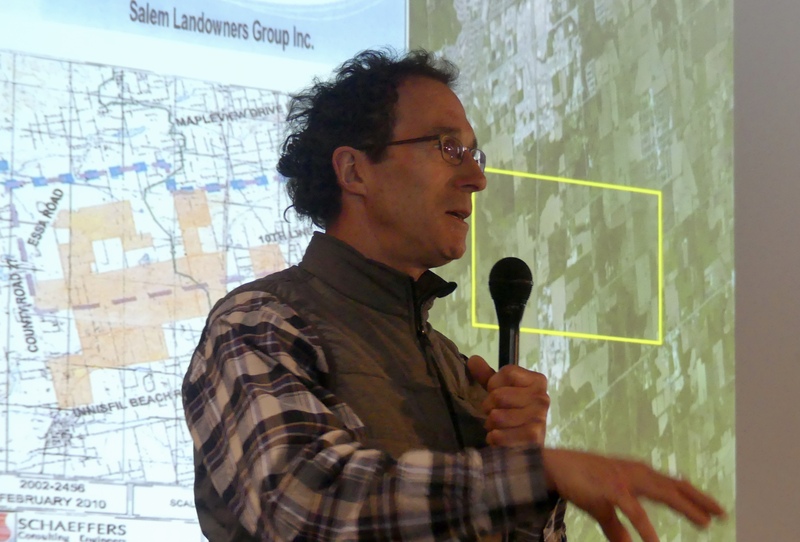 The meeting was organized by NDACT (North Dufferin Agricultural and Community Taskforce, known for its 2012 defeat of a Boston hedge fund’s plans for a limestone mega-quarry in the fertile farmland 100 km northwest of Toronto). Schreiner said he is the only provincial party leader to have signed NDACT’s Food & Water First pledge. Protecting farmland may benefit the environment, but it also makes economic sense, Schreiner said. The agri-food sector employs 822,000 people and generates $40 billion a year in gross domestic product. “Why would any government, particularly a government that is pro-business, want to pave over this asset base?” he asked. Schreiner said he favours cutting red tape, citing an example recently shown to him of a form that in British Columbia takes up one page, and in Ontario amounts to eight pages for the same application. But as for regulations that safeguard children, reduce exposure to toxic substances or protect water or other resources, “I wouldn’t consider that red tape,” he said. Schreiner added that the mega-quarry victory and the Food & Water First campaign demonstrate that Canadians care about food security. “A country that cannot feed itself is just as insecure as a country that cannot defend itself,” he said. Doyle cited other ways in which sprawl makes no sense, quite apart from the impact of the loss of food land and the loss of environmental services provided by forests and wetlands. There’s an economic toll to gridlock, air pollution, health problems and infrastructure challenges. “There’s not enough money to pay for continued low-density sprawl,” he said, noting how municipalities are continually seeking infrastructure funding from higher levels of government. Doyle took the meeting through a history of the past 50 years of bi-partisan land-use management in Ontario. The practice has been to plan for a 25 to 50-year horizon, he said. He showed a series of maps that demonstrated how aquifers are under stress, the quality of surface water that feeds rivers and lakes is deteriorating, and agricultural land is disappearing. One such map had provincial policy makers scratching their heads, he said. It shows more agricultural land per person is being lost in the outer ring beyond the Greenbelt, places like Simcoe, Dufferin, Waterloo and Kawartha – even though provincial policy is to focus 75 per cent of growth within the GTA. One of Doyle’s maps showed how major corporations are assembling thousands of acres of farmland, presently designated rural, in the hope that in the future they will be able to urbanize it. One example was of Walton International Group’s holdings of 5,000 to 6,000 acres of land around Brantford, another of Salem Landowners Group which has 1,000 to 2,000 acres south of Barrie between Highways 27 and 400. This was a really great meeting with 2 outstanding speakers! The Walton group of companies are known for their land-development operations on 80,000 acres in the U.S. and 25,000 acres in Canada. Walton’s website valued these at $5.1 billion as of June 30, 2016. An unsecured-bond offering memorandum a few years ago stated that Walton International Group Inc. had nearly 86,000 investors in North America, Europe and Asia. It would be an understatement to say those investors are unhappy. In the past Walton was predominantly a land-banking company, buying land and then reselling it to investors by way of fractional interests in the land, or units in limited partnerships. Investors typically paid more than double what Walton had initially paid for the property. It focused on purchasing sites at the fringes of urban boundaries and then sitting on the land for years until it could be sold to developers at a hefty premium. According to securities filings, some investors were told to expect to wait eight years before they would see a return on their investment.